Two days left in the month, hopefully I don't buy anything new this weekend! But if I do, I'll update the post. After my vacation I tried really hard to not buy any clothes (or other unnecessary items) to help recoup my bank account. I ended up having to buy a few bits and bobs, like a new battery for one of my computers, (ugh) and I couldn't resist a Madewell sale, where I bought 2 basics with advertising money! They haven't arrived yet so I have no photos. But I behaved for the rest of the month! I really need to add more basics to my wardrobe, quality ones! Not cheap ones - Shopbop seems to have a good selection, may be doing that this weekend! Ohh these are great additions to your wardrobe. I've been trying to shop by the same rules as well, quality over quantity has been my motto for sure. 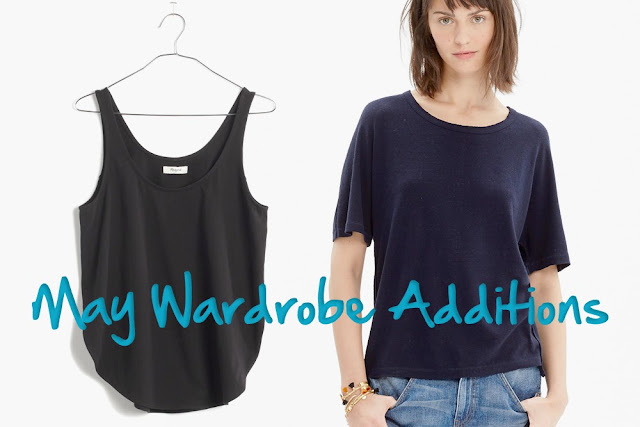 Every so often I think it's important to re-vamp your wardrobe basics, I definitely need to do that too! I especially need a few new button down shirts & some more menswear inspired flats for the office. You got a lot of great pieces! I always think basics are great investments - I have too many printed/statement pieces and not enough basics, so lately I always head towards buying more basic things. Although it means I have ended up with a lot of grey and a lot of stripes, haha! Oh, I'm so bad when it comes to sales. I find very hard to resist good bargain. I haven't bought nothing new in a while. I think since April or even March, but I can't stop buying new pears, crystals for my jewelry and looking at the gorgeous closes online. Maybe it's weather. Today it's raining and nothing more then knits have been on rotation. I can't wait when it will be warmer. great post! I strongly agree about quality over quantity! I only buy what I love. I try and go through my closet every 6 months and edit.... Sometimes I have nothing to donate but other times I realize there's a lot to go through and donate. Love the side slit tanks - how revealing for you!